I've been waiting patiently for a paperback edition of Nina & Eddie's last adventure to hit North America, but it looks like I might have to break down and read the e-book before this is released. I've not had the pleasure yet of reading McDermott. With a series name like Wilde and Chse though, this one sounds like so fun. 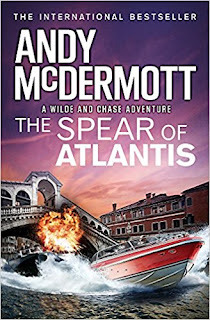 I've never read this author but I'm intrigued by anything "Atlantean."